Now that we have the holes all drilled, it’s time to start building the LED Matrix panels. This is the most tedious part of the job. The LEDs come in strings of 50 bullet pixels with each pixel about 3 inches apart. There are some important tips you need to know first before starting to pop your LEDs into place. WS2812 Bullet Pixels have a data direction that you must pay attention to. There is a small arrow on one side of the bullet pixel. That arrow points to the data flow direction. Different manufacturers have their their arrows facing different ways so beware! The arrow indicates what side of the pixel data flows into and out of the pixel.The bullet pixels we are dealing with have 3 wires in and 3 wires out of the pixel. Some have 4 wires but try to get the ones that only have 3. They are easier to work with and less hassles. On one side there is a positive power wire, a data wire and a negative wire. On the other side you have the same arrangement… positive, data and negative. The arrow indicates which way the data flows through the pixel.Data comes into the pixel from the controller on the data wire then comes out of the pixel on the data wire on the other side which passes it to the next pixel and so on and so on. 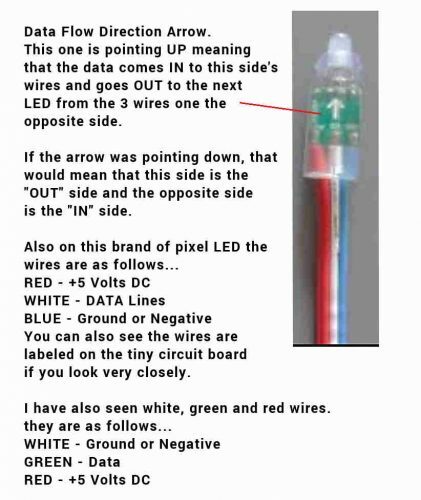 When connecting these, make sure the data arrow is indicating data getting passed to the next LED, not out from the next LED.On most that I have seen, the connector is a female plug that is the input from the controller but I have seen some where the male end was so pay close attention. Pigtails shown (red and blue wires). Note the connector hanging off lower right. This is where the controller will connect to the first section. we didn’t add power, your strings would be so dim and possibly not work at all by the time you get down to the last LED in the string due to the huge power draw.When on full white, one LED can draw .06 amps. 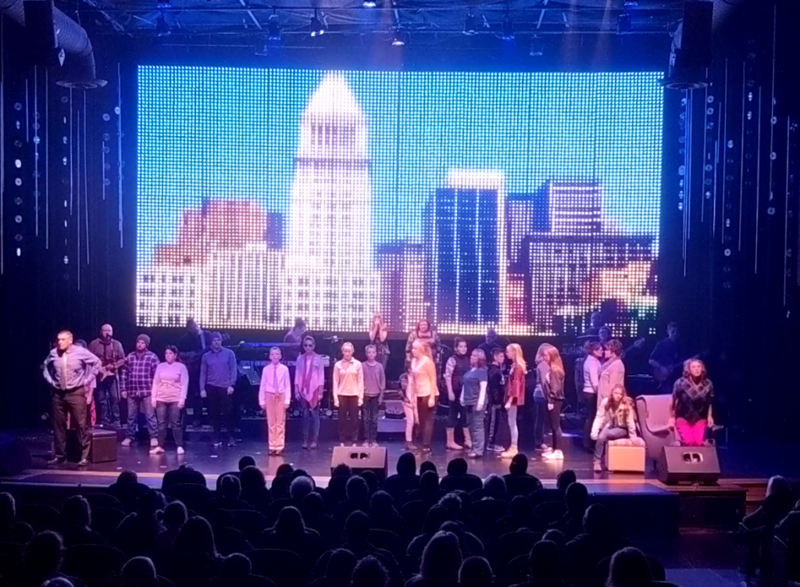 Multiply that times the number of LEDs in the strings we are going to connect together and that number gets huge. That little wire they use cannot supply that kind of power so we power inject. To supply the large amount of current to power inject we use regular 12-2 house wiring. This can handle was more than the demand the LEDs can dish out and is necessary so don’t skimp on the wiring size. You can use 14-2 wire if you like but it doesn’t cost that much more for 12-2 is stiffer so it holds it’s shape better. There is only 5 volts running though the wire but up to 40 amps of current. Each panel will be made by placing 2 4′ x 8′ sheets of corroplast end to end except overlapping the last set of holes on the top board with the top row of holes on the bottom board. 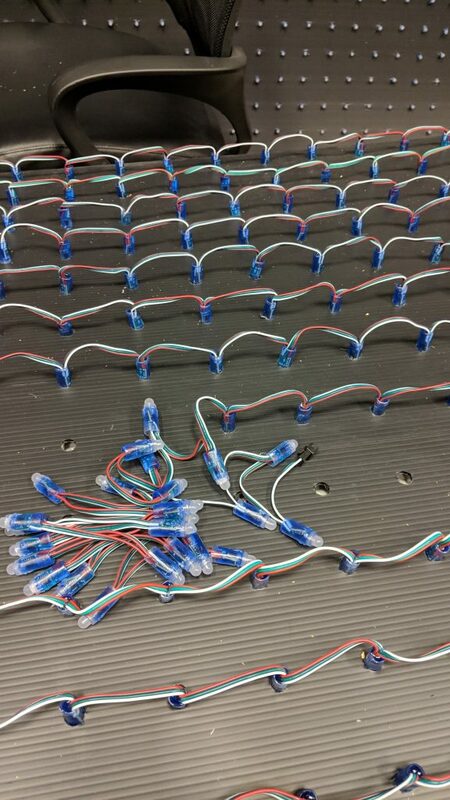 Each board has 38 rows and we only need 75 LEDs vertically so there is an extra row of holes. 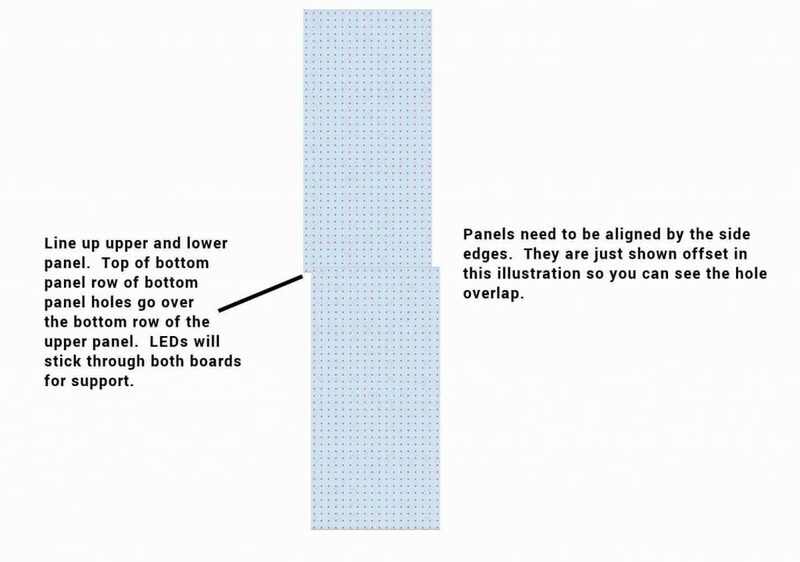 Just overlap the two boards and use the holes mention. 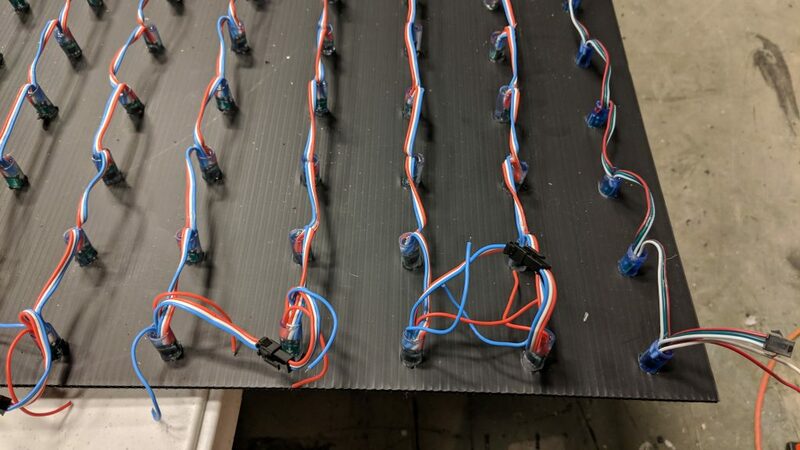 That will result in 75 rows and also since the leds on the over lap will be going through 2 boards, it helps hold your boards together. You will not see the overlap since there will be low light in the room in most installations. You can get creative yourself about this alignment if you want to do it another way. Have someone help you move the full panels. Two people can handle one but one person cannot. They are not heavy, just very long, flimsy and awkward. You could also have help popping in LEDs. It’s a big job for one person. Wear gloves when popping in the LEDs. I don’t care how tough your hands are, They will get very sore if you don’t. So now that the tips are out of the way, lets begin filling out panels with LEDs. From this point forward whe I speak of a panel, that will mean one 16′ high by 4′ wide section of coroplast put together as mentioned in tip 4 above. That full panel will have 18 columns and 75 rows. Since we have 16 ports on our controller, we are going to divide up the LEDs. The way I designed this was to get the most frames per second I could get. The f16V3 pixel controller can do 40 frames per second if the LED count per channel is kept under 680. Go over 680 and the frames per second drops to 20. So I designed this to have 675 LEDs per channel. 675 divided by 75 (rows) is 9 so we will have 9 columns per channel. Each full panel will have two complete 975 LED 9 column sections since there are 18 columns per board. Now you are beginning to see why there are 18 columns by 75 rows per full panel. It wasn’t just by chance. It was all calculated out after days of figuring out the best configuration for the size, speed and cost. I built mine starting from the right for reasons I don’t want to go into right now and that made mapping the pixels in the software quite a challenge, so for you… lets make this a left sided configuration. It will be so much easier for you when mapping the pixels. Starting with a full panel of coroplast laying FACE DOWN (there is no real front and back so this will become your “Back side”). I put mine on 2 8′ folding tables put end to end. You can lay it on the floor but that could get pretty back breaking. You may want a rolling office chair also so you can sit down and do this. Snake configuration. LEDs wind back and forth for 9 columns. Since this is the back of the full panel and we are going to start on the left side, the right side is actually the left side. Once you determine the data direction of your bullet pixels, you want the data to come in from the controller and up the panel. Start in the lower right hand corner leaving the connector hanging off the edge and start popping your LEDs into place. Wear Gloves. Your fingers are going to hurt if you don’t. The LEDs will pop when they are seated. Try not to push them in too far. You will get a feel for what a fully seated LED feels like when it pops in. Once popped in, it will be fairly hard to pull out due to the small barbs on the bullet pixels which is designed to hold them in. Keep popping them in until your get to the last one in line. Plug in the next set of LEDs by plugging their connectors together and continue popping that set in. Keep going until you reach the top. Once you get to the top, just jump left over to the next hole and come back down popping them as you go. This is called snaking. 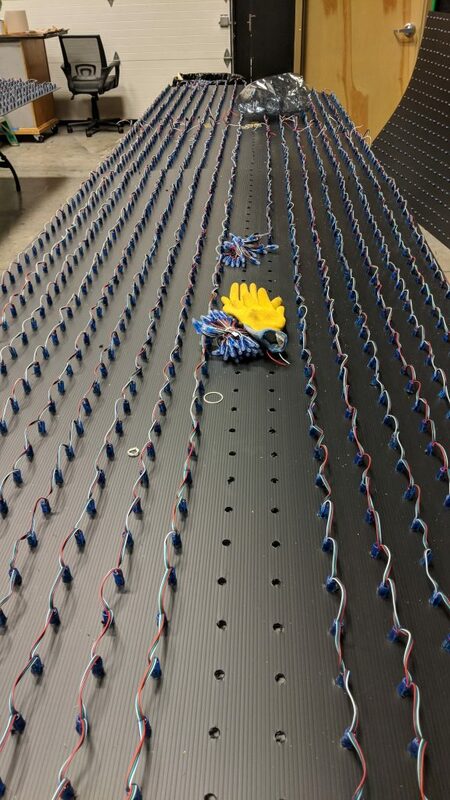 Keep adding strings and connecting them together until you do a full 9 columns of LEDs. There will be 25 extra LEDs when you get to the last hole. If there is not 25 extra LEDs you did something wrong somewhere like skipping a hole or something. Find where your problem is until you have 25 hanging over the edge. We will cut these off later and maybe use them for another panel if needed. You now have one full port section done. Do the exact same procedure for the next set of 9 columns but make sure to leave the connector (10th hole from the bottom right) hanging so you can connect it to the 2nd port on the controller. You will also notice that all of the pigtails line up across the panels. A nice little side effect of keeping the height in multiples of 25 (50,75,etc…). This makes it easier to wire the power injection to the power supplies by making “power rails”. I’ll explain later. After you have two full sections of LEDs loaded into the full panel, you are ready for wiring. The wiring is really for power injection since these need power to be supplied for full power. I would advise wiring this unit now instead of trying to load all of the LEDs in all of the panels first. Unless you are in a warehouse with ample room, things could get crowded quickly so I had to do a complete working panel at a time. You may have the room so do whatever you need. Each full panel will be a duplicate of this full panel (8 full panels in total). We are going to get into the wiring next and we will do that in part 4. Click here to go to Part 4 – Wiring the power.